While I try to keep postings on this site to the subject of publicly owned networks, I think it important to discuss the ways in which some major carriers routinely flout the public interest. Thus, a little history on how Comcast has acted against the public interest. Most of the readers of this blog are probably aware that Comcast has been dinged by the FCC following its practice of interfering with subscribers legal content (and undoubtedly illegal content as well) by blocking and disrupting the BitTorrent traffic. BitTorrent is frequently used to transfer large media files because it efficiently breaks large files into many little pieces, allowing the user to download from a variety of sources concurrently - the file is then reassembled. 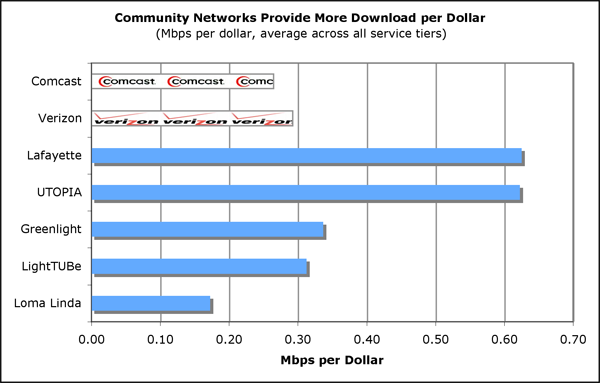 When Comcast detected BitTorrent connections, it would effectively hang up on them, regardless of the congestion level on the network at the time. The FCC (the Bush Administration's FCC) said it couldn't do that and Comcast is currently in the courts trying to tell the FCC that it can't tell Comcast what it can't do on its network. Prior to a journalistic investigation that proved Comcast was doing this, net geeks had repeated asked Comcast if it were blocking the BitTorrent protocol. Comcast never admitted to anything, often claiming it did not "block" anything... as time would go on, Comcast would refuse to admit it was blocking anything - as if permanently delaying traffic was anything other than a blockage. "I'm not blocking you, try back in 20 million years." Around this time, Comcast quietly changed its policy regarding the maximum amount of bandwidth subscribers could consume in a month. At the time, I thought it was a result of the FCC cracking down on the arbitrary policies frequently used by cable companies, but it turns out we can thank the State of Florida for forcing Comcast to enact a transparent cap on monthly usage. Prior to the official cap, there was an unofficial cap. Every month, some number of people would be notified they were kicked off Comcast's service for using too much bandwidth - but no one knew how much was too much and, perhaps more importantly, how to keep track of how much bandwidth they were using. Discussions on geek-hangout Slashdot suggested a monthly cap of between 100 Gigabytes and 300 Gigabytes depending on the neighborhood. There was no limit documented anywhere and Comcast representatives refused to acknowledge any hard cap. The FCC recently asked for comments about how broadband should be defined. There was a marked difference between those who put community needs first and those who put profits first. Companies like AT&T and Comcast were quick to argue that the FCC should not change the definition of broadband for reasons ranging from too much paperwork to the suggestion that rural people have no need for VoIP. The honest approach would have been for these companies to say they do not want a higher definition because it will change their business plans, likely requiring them to invest in better networks for communities, and that will hurt their short term profits. On the other side were groups that argued for a more robust definition of broadband - something considerably less ambitious than our international peers but an improvement over the current FCC definition. NATOA's comments [pdf] focused on issues like the need for measurements based on actual speeds rather than advertised and symmetrical connections (or at least "robust upstream speeds to facilitate interactivity" - which we think captures the importance of symmetric connections without getting lost in debates about absolutely symmetric connections). The key metric for broadband should be the applications and needs that drive consumer requirements and choices. In this way, broadband should be understood as a connection that is sufficient in speed and capacity such that it does not limit a user’s required application. Their magic broadband number is a reasonable and doable 10Mbps symmetric connection for residential and small businesses as well as a 1Gbps level for enterprise users. Importantly, they note that a single broadband connection supports far more than a single computer or use - these connections are shared, often among many wired and wireless devices. Compare these comments to those of the NCTA [pdf] (lobbying organization for cable companies) that argue broadband is nothing more than an "always on" connection regardless of the speeds or user experience. This is how they justify maintaining the international laughingstock definition of 768kbps/200kbps. The Chattanoogan.com published a "Declaration of Independence from Comcast", written by a "fi-oneer" or person who is testing the new publicly owned FTTH services. The television is fantastic; we have a multitude of channels, both high def and non high def; local, 'cable,' sports, movies, etc. Contracts are still being completed with a couple of providers, so we are missing my favorite, HGTV. I have been told that it will be coming in less that two weeks. Although as with any new product there are occasional glitches, but we have only had a few, minor not major ones, at that. The picture might freeze for a few seconds, or pixilate for a few seconds. There are some things you need to learn about the remote control. Interestingly, early problems can actually help community networks. 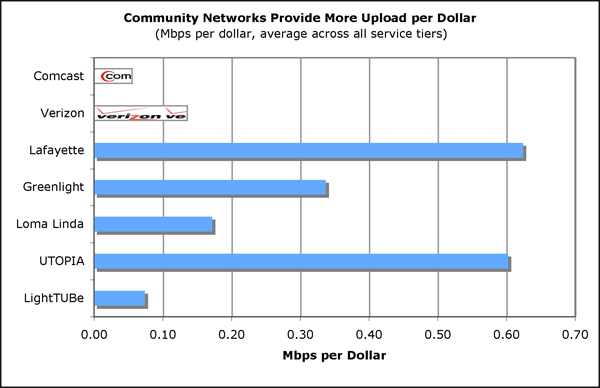 In Burlington, Vermont, early problems allowed the publicly owned network to demonstrate how good its customer service was compared to the incumbents and gained a better reputation. More news out of Seattle - following up on our recent story noting Reclaim the Media's push for public broadband in Seattle, Seattle radio station KUOW's program "The Conversation" had some guests discussing the existing network in Tacoma and a potential network for Seattle. Follow that link to listen in, the relevant portion runs from 14 minutes to 21 minutes (a total of 7 minutes).